The year is still relatively young, so it’s not too late to make a couple of financial goals for the new year. One of the best things you can do now is to prepare for the future by boosting your retirement contributions. If you aren’t maxing out your tax-advantaged retirement account, you have room to improve your saving efforts. While you might not be quite ready to completely max out your retirement savings, putting in a little more now can help you a great deal later, thanks to the power of compound interest. At first glance, you might think that you don’t have any extra money to put toward your retirement savings right now. Figuring out how to save for retirement isn’t always easy. 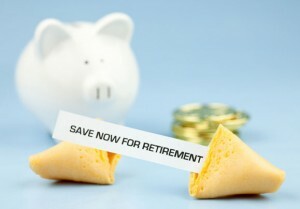 The good news is that you might not need to find “new” money to boost your retirement savings. You might be able to turn your financial waste into a more secure future. One of the realities of personal finance is that you likely waste between 10% and 15% of your income each month. That means that if you bring home $3,000 a month, there is a good chance that at least $300 of is wasted through leaks in your budget. Even if you don’t apply that entire $300 to your goal of saving more for retirement, there is a good chance that you can recapture some of that money for your future. Take another look at your budget, and be brutally honest. Are you spending on things that don’t make sense — especially when compared with your financial priorities? Can you identify some ways that your financial resources are going to waste? Find those items, and then cut them from your budget. Even if you only cut one of those wasteful items, and apply that money to your retirement savings goal, you are still in a better position than you were before. Make that contribution a monthly habit, and the difference could be huge over time. You can start a side hustle, and add the proceeds to your retirement account. Or, once you are comfortable with the small increase you have already made in your monthly contributions, you can review your budget again and look for another small item of financial waste to turn into future wealth. After awhile, your efforts can become something of a game — and a point of pride when you “win” and find a little bit more to use to boost your retirement savings. Consistency and the amount you save are two of the most important factors in saving up enough for a successful retirement. Don’t get complacent about your retirement savings efforts. Make it a point to try to improve your financial future by boost your retirement savings in the new year. Retirement Guide: Should You Remodel or Move?